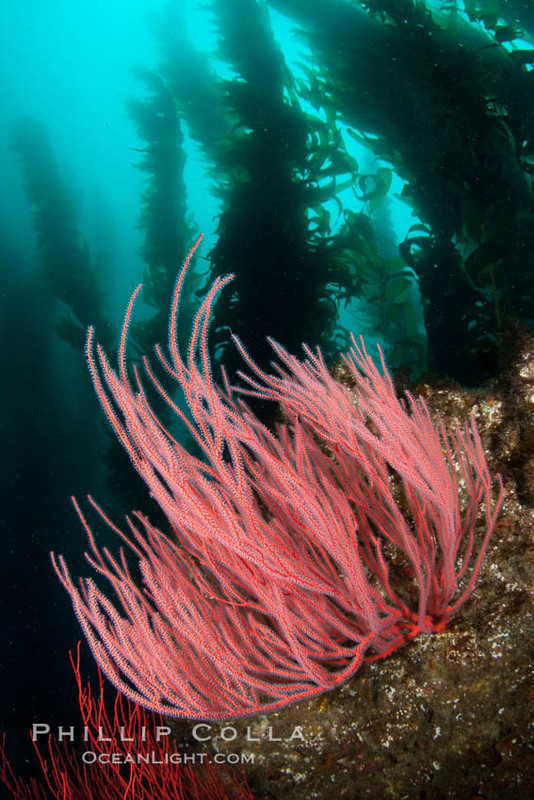 Photos of gorgonians and sea fans at San Clemente Island. I spent three days diving at one of my favorite spots on Earth: San Clemente Island. The island, about 60 miles offshore of southern California, is home to some of the world’s most beautiful kelp forests. Swimming through these kelp forests is akin to flying through a forest of towering redwoods. 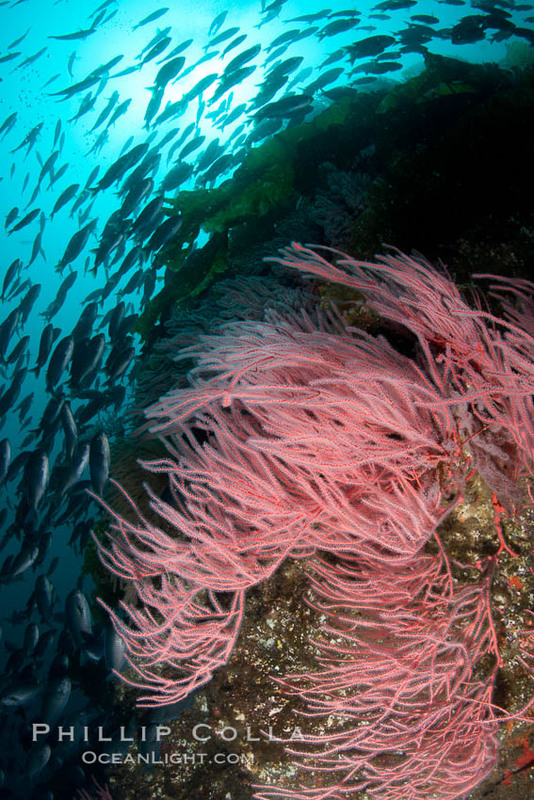 Below the tall kelp plants are rocky reefs where gorgonians, also known as sea fans, anchor themselves. Gorgonians are filter feeders, and spread their long slender arms out into the currents where individual polyps will catch and eat organic debris and plankton that floats by in the current. 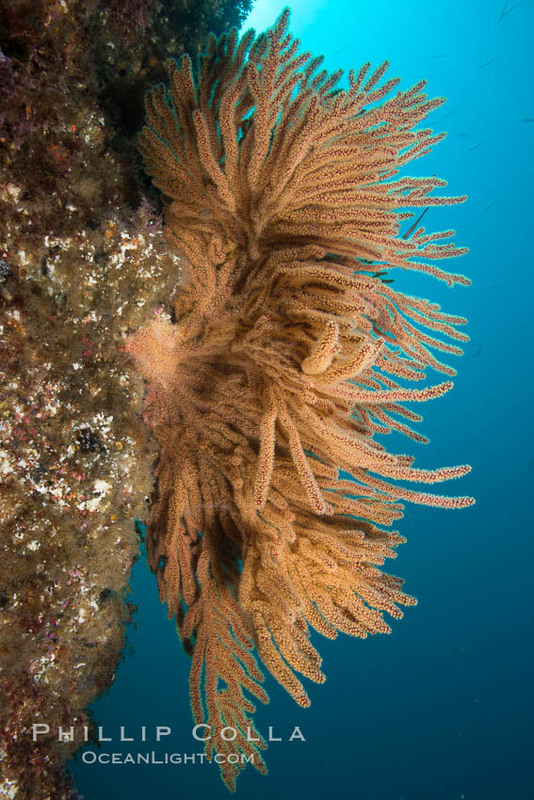 I have a few favorite reefs at San Clemente Island where I know I will always find magnificent examples of gorgonians, several feet in diameter and exhibiting healthy polyps and rich colors. My goal on this trip was to shoot a few good images of the several species that are commonly found at San Clemente Island: red gorgonian (Lophogorgia chilensis), California golden gorgonian (Muricea californica), and brown gorgonian (Muricea fruticosa). Bryozoan grows on a red gorgonian on rocky reef, below kelp forest, underwater. The red gorgonian is a filter-feeding temperate colonial species that lives on the rocky bottom at depths between 50 to 200 feet deep. Gorgonians are oriented at right angles to prevailing water currents to capture plankton drifting by. Red gorgonian on rocky reef, below kelp forest, underwater. The red gorgonian is a filter-feeding temperate colonial species that lives on the rocky bottom at depths between 50 to 200 feet deep. Gorgonians are oriented at right angles to prevailing water currents to capture plankton drifting by. California golden gorgonian on rocky reef, underwater. The golden gorgonian is a filter-feeding temperate colonial species that lives on the rocky bottom at depths between 50 to 200 feet deep. Each individual polyp is a distinct animal, together they secrete calcium that forms the structure of the colony. Gorgonians are oriented at right angles to prevailing water currents to capture plankton drifting by. A few photographic notes: these images were all shot with a 15mm fisheye lens and two submersible lights. Certain colors, suchs as reds, oranges and yellows, effectively disappear below about 10′ deep. 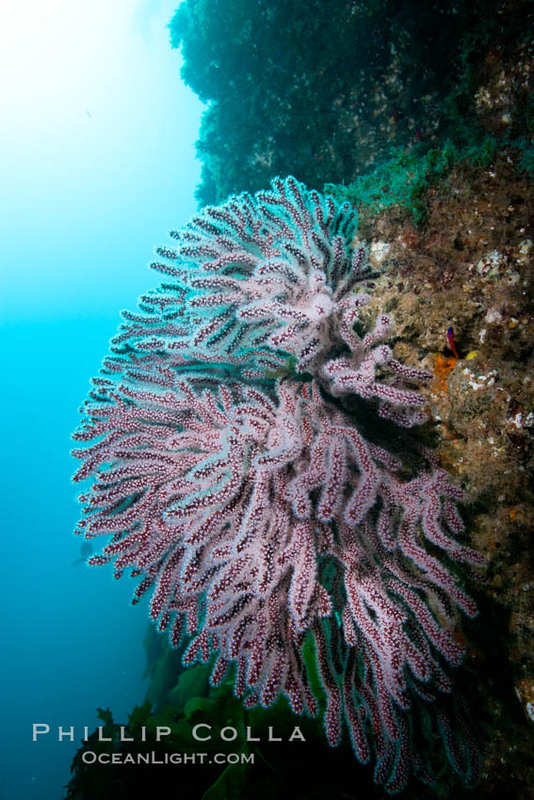 Submersible lights are used to bring out the color and detail in these gorgonians, which in the available light would appear colorless and drab at these depths. The water in California tends to have particles floating in it and consequently is not as clear as water in the tropics. To minimize the degree to which poor water clarity adversely impacts the photograph, I get as close as possible to my subject. In these photos, my camera is only about 6-10 inches from the gorgonians, so a very wide lens is required in order to depict the entire sea fans. 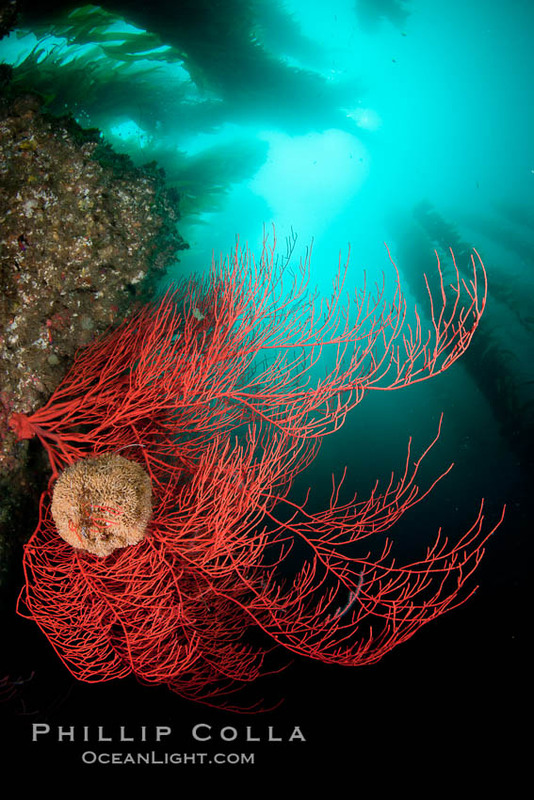 These images were taken at depths from about 45′ to 70′, all of them at the southern end of San Clemente Island. In all of them, the camera is pointed almost straight up toward the surface, so that some of the sunlight and kelp forest that rises above these gorgonians can be depicted. I hold my breath to make sure my bubbles don’t get in the photo.